Elfords sheds is a family run business known for the manufacturing of high quality garden buildings based in Chichester, West Sussex. Established by Mr. Anthony Harris (Senior) in 1986, our business has become well known in the West Sussex Area with 60% of our work coming from the recommendations of satisfied customers. Check out our excellent Elford Sheds of Chichester checkatrade reviews. 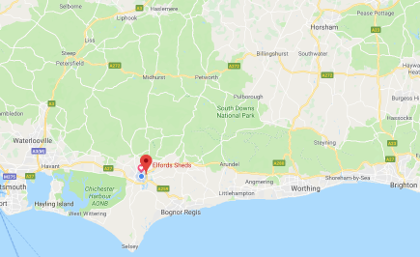 Elfords offers a free delivery and erection service in the highlighted coverage area of West & East Sussex and Hampshire. We deliver and erect garden buildings for free in Angmering, Arundel, Billingshurst, Bognor Regis, Bosham, Brighton, Chichester, Emsworth, Haslemere, Havant, Hove, Littlehampton, Midhurst, Petersfield, Petworth, Pulborough, Selsey, Shoreham, Storrington, Worthing. If your are outside this area please contact us for a quotation on delivery and erection of your chosen shed.